Some decision-forcing cases require that students use formal analytic techniques to make sense a data set before they come to class. Others need nothing more than a willingness to engage a problem faced by a real-world decision maker at some point in the past. Between these two extremes are many different degrees of pre-class preparation. Students may be asked to analyze, in an informal way, a body of evidence. They may be asked to read an article, or watch a video, that provides background to the case. At the same time, students may, or may not, be asked to complement this individual preparation by discussing it with a small study group. As the use of study groups correlates strongly with the more demanding forms of individual preparation, it is possible to lay out the many different types of cases along a single axis, creating what might be called the "case method preparation spectrum." On one end of the spectrum is a case that requires students to use, as individuals, particular analytical techniques to examine a particular data set and then to discuss their findings, as well as other evidence, with a small study group. (The analytical techniques in question would depend on the subject being studied. Thus, a class in logistics might ask students to employ critical path analysis while a class in tactics might ask students to create an artillery overlay.) On the other end of the spectrum is a case that requires no particular preparation on the part of the student. As cases on the far left of the spectrum play a large role in the curriculum of the Harvard Business School, they might be called "Harvard-style cases with formal analysis." Similarly, cases that require both individual and small group preparation, which also abound in the vicinity of Soldiers Field, might well be called "Harvard-style cases with informal analysis." 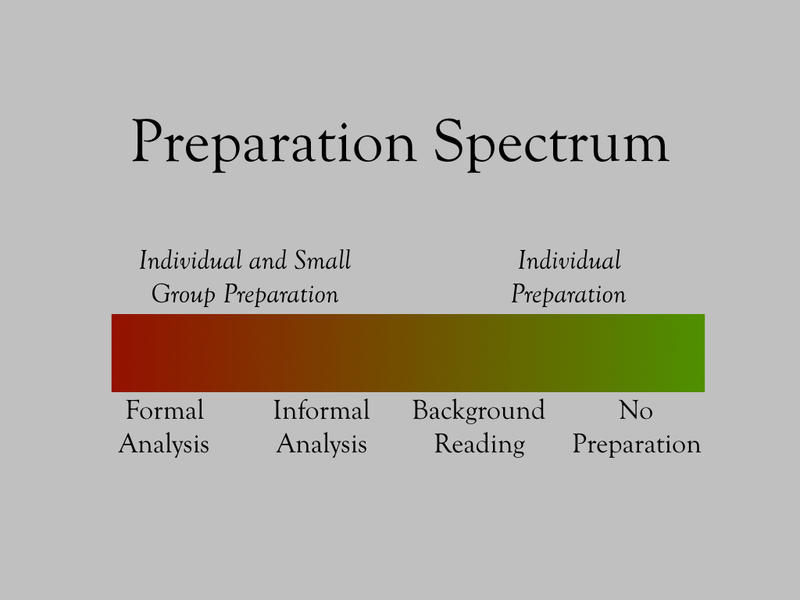 Cases on the far right of the spectrum are the sort that are used in situations, such as conferences, where it is unrealistic to expect participants to engage in any sort of preparation. They can therefore be called "conference-style" cases. 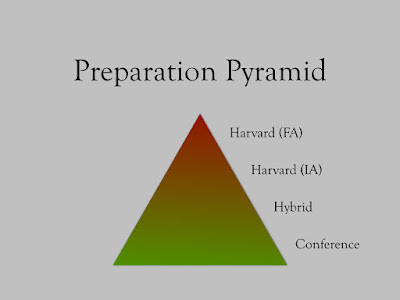 Cases that fall into the space between the zone of Harvard-style cases and conference-style cases, those for which pre-class preparation is primarily a matter of learning about the broader context of a case, partake of some of the characteristics of the cases on either side of them. For that reason, they are sometimes called "hybrid cases." Learning how to learn from cases on the left of the spectrum is not easy. For that reason, it often makes sense to begin a case-based course with cases from the far right. Thus, for example, the first case of a course might be a simple conference-style case, one that is used both to introduce students to the subject of the course and to the essential features of an in-class case discussion. The next two or three cases in the course might be hybrid cases, each of which is preceded by readings of increasing difficulty. Prior to the fourth or fifth case, the instructor would introduce the concept of the study group, thereby empowering students to engage their readings with a greater degree of rigor. Once the habits of preparing for a case discussion with the aid of a study group were well established, the instructor could then begin to require the use of particular analytic techniques. In such a course, the cases that require less preparation will provide students with many of the skills they need to tackle cases that require more in the way of preparation. More than that, after working through several relatively simple cases, some students will feel the need for a more sophisticated approach. They will want more in the way of background, more data that bears upon the problem, and better ways of making sense of that data. In other words, working through cases that require less preparation will create a demand for cases that require greater preparation. The "preparation pyramid" illustrates that way that experience with relatively simple cases make students both capable and desirous of engagement with more sophisticated cases. It also suggests that, in any school that makes extensive use of the case method, cases that require less preparation will be more numerous than cases that demand more of the student before he enters the classroom.